If you follow the SF world at all, you know author Anne McCaffrey passed away yesterday at the age of 85. And the world has a little less wonder in it for her passing. Like most, my introduction to her work was through the Pern novels. I discovered The White Dragon while perusing the shelves at my school’s library. Having just moved to a new city, and feeling a bit strange in my new school I felt a connection with the characters of Ruth and Jaxom as they tried to find a place for themselves. Once I finished I quickly checked to see if she had written anything else, and behold! There were five other books already set in this new world of Pern. Thus began my love affair with telepathic dragons, brave dragonriders and talented harpers. For years I eagerly devoured every new Pern book that came out. Eventually this led me into Anne McCaffrey’s other worlds; The Ship Who Sang, Acorna, the Catteni Sequence, The Crystal Universe. But through it all I always came back to Pern, with its soaring dragons flaming thread from the sky. 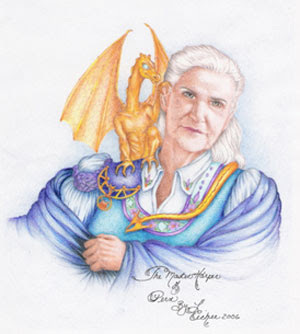 Pern and Anne McCaffrey were the first to introduce me to the idea of expressing my fandom, with a book entitled A Dragonlover’s Guide to Pern. Up to that point I was content to read SF, and that was about it. But Dragonlover’s, a sort of atlas/encyclopedia of Pern, included things like recipes for dishes from Pern. I could actually make bubbly pies and drink klah! It seems a small thing now, what with all the interactive content, geeky t-shirts, fan videos and so on that can be found related to every SF subject imaginable. But back then it blew my mind; I could actually bring some of what I loved from these books into my own life and share them with other Pern fans. If I had to trace it back, that point was where I made the switch from someone who enjoyed SF, to an SF fanboy. Her work also broadened my interpretations of what is sci-fi and what is fantasy. Naturally, at the time I started reading The White Dragon and Dragonriders, I thought of them as fantasy. After all, there were dragons, right? And any D&D player worth his salt will tell you that dragons=fantasy. But as I read more and varied works, every time I revisited Pern I had to let that narrow interpretation go a bit more. With ever-changing eyes I started to see the science that was always there, obscured by my youthful ignorance. It is certainly possible I would have come to these broader ideas on my own at some point, but Anne McCaffrey was responsible for the relative ease with which the ideas came. I could delve into all the little nuances of how her work affected me or helped me. But at the end of the day all that matters is this: Anne McCaffrey told great stories. They were stories of love and honour, stories of bravery and strength. They were and still are just the stories we need to remind us of those qualities inside ourselves. That she has written so many that I can return to gives me hope; that she will write no more saddens me beyond reckoning. But my grief will never go.